There’s always something magical about watching Shakespeare in the High Park Amphitheatre. Amid the picnic blankets and dusky summer air, the 400-year-old words of Twelfth Night leap vividly to life in this production by Canadian Stage in collaboration with the School of Arts, Media, Performance & Design at York University. Music and laughter fuel this fun, colourful adaptation of Shakespeare’s classic comedy, now wrapped in an aesthetic of tie-dye, Beatles glasses, and references to the funky chicken. 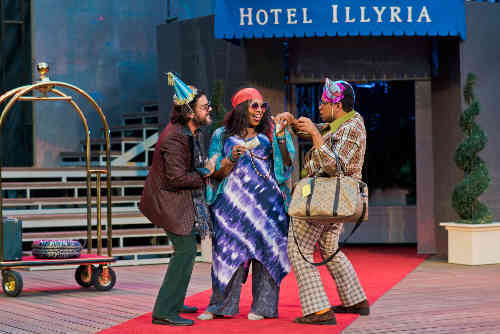 Set against the slick grey exterior of Hotel Illyria in this production, Twelfth Night is a story of romantic misadventure. In true Shakespearean style, this play involves cross-dressing, twins, and many comic misunderstandings. The story follows shipwrecked Viola (Amelia Sargisson), now disguised as a man named Cesario, who is in love with the great Orsino (Richard Lee). But Orsino loves the unattainable Olivia (Naomi Wright), who falls in love with Cesario in turn. Meanwhile, Maria (Hannah Wayne Philips) and other members of Olivia’s inner circle hatch a petty revenge plot against uptight steward Malvolio (Tanja Jacobs). Things come to a head when Viola’s twin brother, Sebastian (Brett Dahl), comes to town, and chaos ensues. I greatly enjoyed this talented multiracial cast. The audience loved Jason Cadieux and Peter Fernandes as Sir Toby and Sir Andrew, a pair of rakishly dressed rogues. Sargisson played a highly compelling Viola whose longing for Orsino was raw and believable. My favourite parts of Twelfth Night were Sargisson’s scenes with Wright, who truly stole the show — it was a joy to watch her funny, earnest, and sophisticated portrayal of Olivia. This production of Twelfth Night also made great use of music. Feste (Jenni Burke) entertained us with several boisterous songs, while Valentine (Michael Man) took to the piano to add atmosphere to several scenes. When the cast accompanied Feste’s final song, they had the whole audience clapping along. My friend Laura and I also loved the dance performance by Viola/Cesario and Orsino, which was at once entertaining and useful to the story. They are both superb dancers and their duet helped me connect to Viola’s romantic longing. The only small note of discord that I can report — other than a lack of resolution to the promising relationship between Sebastian and Antonio (Kristiaan Hansen) — concerns Malvolio. Performer Robert Persichini was ill and unable to perform this role on the night I attended, so Twelfth Night director Tanja Jacobs stepped in. I found it quite distracting to watch Malvolio read his lines off the script, but she was clearly doing her best and this arrangement will hopefully be temporary. Overall, there’s much to celebrate in this production of Twelfth Night. Bring your picnic and your friends — or your long-lost twin brother — and enjoy. Twelfth Night is performed in repertory with King Lear at the High Park Amphitheatre (1873 Bloor Street West). Performances run until September 3, 2017 with rotating 8pm performances every day except for Mondays. Tickets are free for children 14 and under, and pay-what-you can at the door for adults with a suggested contribution of $20. Advance tickets are $25 and can be purchased online.